The sun was shining and I was smiling. You would think folks had never seen a guy running 10 miles barefoot in the snow! Note to self: Constant foot sinking in the snow can cause minor abrasions around the ankle if the snow is a bit melty and then has a thin layer of ice. No harm done, but consider this info in the future. This was an instructive barefoot run today. In past winters, I have ran at this temp with no adverse affects, as I did today. However, the one big difference on this run was not that the wind chill was 0 degrees F, but that the west/east direction of my run allowed for dry conditions on the sidewalks while running west, but coming back east most of the sidewalks were frozen with ice and snow. Running west/east allowed me not to run directly into the north wind, also. This was the first time I ran several miles of my 10 mile run on ice and snow when the temps were at 15 degrees F.
Tomorrow, the temps are forecasted to be about the same or a little colder. However, snow is predicted for tomorrow. If there is new snow, without the benefit of the minimal sun warmth that I get from the sidewalks, I doubt whether I will be venturing out tomorrow. Most probably, it will be a treadmill run if hazardous conditions exist. 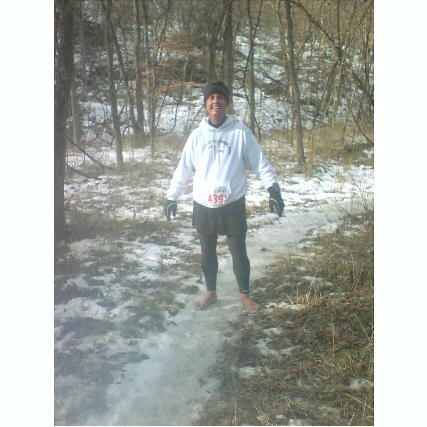 Well, today's winter 10 mile barefoot run was another adventure! It started snowing here in Overland Park where I work at about 9:30 this morning and I went out about 11 a.m. to run. Temperature was 19 degrees but felt colder than yesterday's sunny 15 degree run. ... Click Here for Full Report with Pics! This was one of those days that was "teetering" on the limitations of what and what my feet can take regarding cold weather. Wednesday's snow was half melted in yesterday's 30ish degree weather. Today, it was 13 degrees F with a wind chill of -5 F. The sun was shining, which was nice. The patches of concrete and asphalt that were not snow covered offered a brief respite from the snow. Ironically, however, I couldn't wait until the sidewalk was covered again by snow. It just felt good!! It was fun wearing my groundhog stocking cap in honor of the weather rodent. It was even more fun waving at folks in their cars when I was waiting for the light to change. This is a REAL TRAIL event. Yes, I said TRAIL event. If you want to run on a sissy, paved course, this isn't the race for you! The course consists of rocky, rooty, and hilly bridle trails & single-track trails. It's a loop course, and you will be in the woods, for the most part. The length of each loop is a wheel-measured 10.35 miles ... More!